Product #1367 | SKU JB00128 | 0.0 (no ratings yet) Thanks for your rating! 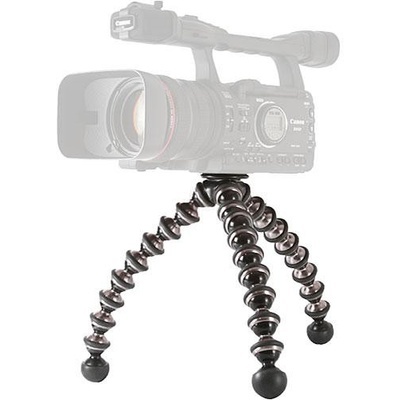 The Joby Gorillapod Focus is an ultra-versatile mini-tripod (or grip) that was designed for use with large pro SLR cameras with large zoom lens attached, or with prosumer level camcorders (max. load capacity of 5kg. The Gorillapod Focus allows you to achieve the stability of a standard tripod, but at a fraction of the size and weight. The three multi-segmented flexible legs can be formed to grip almost any protrusion, be it a branch, doorknob, rock, or uneven surface. Its sockets are machined from sturdy aluminum, with anodized gunmetal finish. Each of the joints can bend and rotate 360°, to wrap around objects. The bottom rubber segment on the legs is larger to allow it to be used in the traditional way. Flexible joints bend and rotate 360° to form the perfect gripping shape.